Gladys Tamayo parks in front of her Norwood Park home every day. But the 75-year-old says something very wrong went down one morning last October. Tamayo got a $200 ticket in the mail for a missing city sticker. The trouble is, Tamayo says the sticker has been on her car since June. "There's no way they could actually write me a ticket if they really checked the car," Tamayo says. Because Tamayo had the receipt to prove she bought the sticker on time, she thought she'd had no trouble fighting the ticket. She was wrong. At the in-person hearing she requested with the city early this month, Tamayo says the administrative law officer was not interested in seeing any of her proof. "He didn't look at papers or nothing," Tamayo recalls. Instead, she says he told her the burden of proof was on her to prove the sticker was there the day the ticket was written. "I said you've got to be kidding me. But he was not joking. He was very serious," Taayo said. On the city's website, one permissible defense for a ticket includes being able to prove the violation never occurred. Residents are not told to take pictures when they affix stickers. 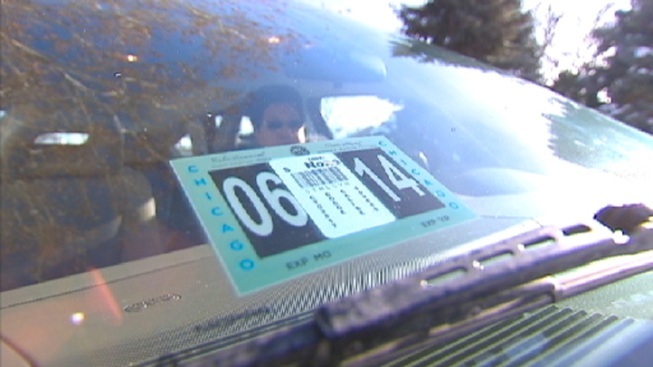 Mike Brockway, the self-proclaimed "Parking Ticket Geek," says drivers should get the benefit of the doubt, especially when the city offers no picture as proof, and the driver offers a receipt. "One would think that should be enough to overturn this, and I have a real issue with the cost of that ticket. It's a $200 ticket," Brockway says. "$200 is a lot of money. But it's more than money. It's the principle here. What is the honesty of the police department?" NBC 5 Investigates asked the city to look into her case. Two days later, the ticket was vacated. A spokesperson for the department of revenue says Tamayo should have been given the benefit of the doubt by the hearing officer. The alderman in Tamayo's ward is now proposing a change in how citizens can fight this kind of ticket.